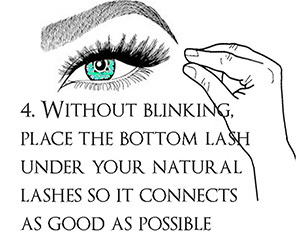 How to apply magnetic eyelashes. 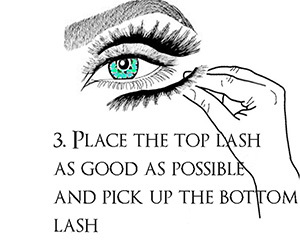 Here a quick guide to how you should apply these Magica magnetic eyelashes. Above the short tutorial from our model. Very important is that you preform the lashes before applying. The new 2018 version has a stronger band which you have to preform multiple times each lash applying. The dual magnetic eyelash becomes more flexible after use so please take your time to make it work. * Each model has it’s own “stiffness level”, repeat the proces till you have the desired curve to fit your own lash line. 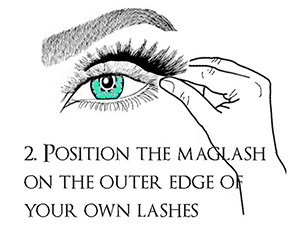 This will help to apply the Magica Lashes easier and with less hassle. If you have any questions about applying, please feel feel to contact us with your question in your own language, we are here to help you! Step. 2 TAKE THE TOP LASH Take the top lash and put it over your own lash with the magnets facing down. Make sure the top lash is curved. Step. 3 PLACE THE OTHER LASH Under your own lash and connect the magnets from below. Make sure you have a steady hand while doing this. Step. 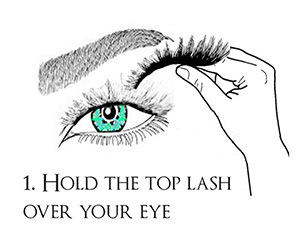 4 FINAL TOUTCH Make small adjustments so the lashes meets your eyelid. If it’s still not working ask somebody to apply while sitting on a chair. Important! To Remove the lashes by gently slide the magnets with your thumb and index finger. Don’t pull it of straight because it can damage your own and the magnetic lashes.